Before you lump DelFest in as "just another festival," consider the line up that includes three dozen-plus bands ranging from the Avett Brothers to Yonder Mountain String Band to Railroad Earth and Trampled by Turtles. Even the DelFest founder, who inherited Bill Monroe's title of King of Bluegrass, will also play several sets. The somewhat eclectic line up -- lots of bluegrass, alt country, roots -- is thanks to Del, a former member of Bill Monroe's Blue Grass Boys, who always believed bluegrass musicians had to push the format's boundaries to keep it vibrant. "I like diversity. I think it's a good thing," Del tells The Boot. "I enjoyed it even back in the 1960s when I was growing up listening to Bill Monroe and Earl Scruggs, when they would play what you would call traditional. Then at festivals in the 1960s, some of these younger guys came in and played a different style of music and I enjoyed listening to it even if I couldn't picture myself playing it." Some traditionalists, including Bill who, of course, is revered as the father of bluegrass, resisted nu-grass' development even though he told Del he learned from those and other musicians. "I remember one time Bill asked Sam Bush, 'Is that kind of music you're playing what they call progressive bluegrass?' recalls Del with a chuckle. "Sam said yes and Bill said 'Yeah. I don't like it.'" 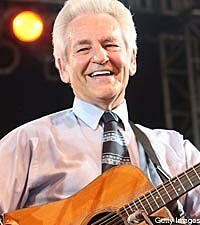 The DelFest lineup is designed to expose fans to different musical styles and allow musicians to learn from each other, both through events including The Academy -- essentially musician workshops led by members of Del's band, including sons Ronnie McCoury on mandolin and Rob McCoury on banjo -- late-night jam sessions, and a bluegrass bands competition. "The thing about it is, you kind of have to play what suits you and what you are happy playing and what you are capable of playing," says Del. "I always learn a lot from different musicians." Kids' activities, an arts & crafts fair, midnight jams and more make DelFest a full-bore party for the whole family. For a full list of performers and more details on The Third Annual DelFest, May 27-30, check the website.